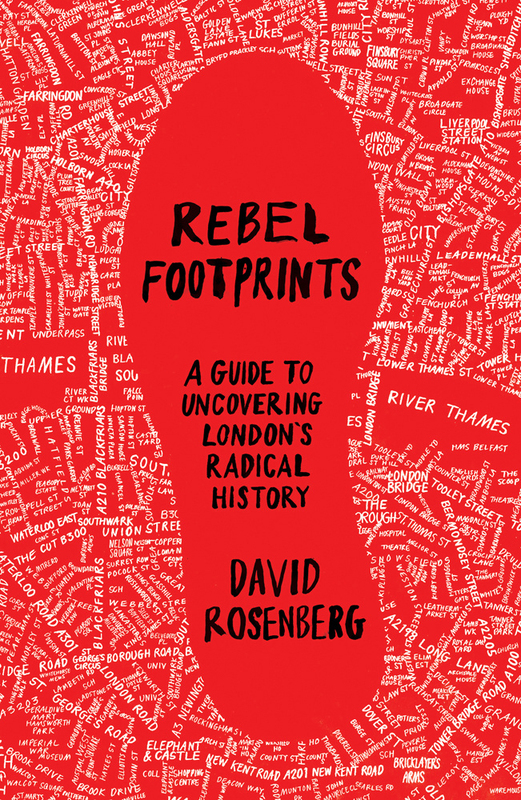 To accompany the launch of his new book, Rebel Footprints: A Guide to Uncovering London’s Radical History, author David Rosenberg is hosting a special east end walk in Clerkenwell. Treading in the footsteps of the area’s Rebels & Revolutionaries, David will deliver expert insight into the fascinating men and women who helped shape the east end. Join him as he reveals how the “grovelling, starving poverty” of mid-19th century Clerkenwell nurtured political rebellion among those fighting for a just society… and discover how a melting pot of everyone from Chartists to Irish rebels to Italian revolutionaries to 20th century socialists lived, campaigned and fought in the heart of the east end. The guided walk takes place on Sunday 19 April at 2 pm, starting and finishing from Finsbury Town Hall. Nearest tube: Angel (Northern line). Buses 19, 38 and 341 pass the door. The radical response to conservative heritage tours and banal day-tripper guides, Rebel Footprints brings to life the history of social movements in the capital. It transports readers from well-known landmarks to history-making hidden corners. David Rosenberg tells the story of protest and struggle in London from the early nineteenth to the mid-twentieth century. From the Suffragettes to the socialists, from the Chartists to the trade unionists, the book invites us to step into the footprints of a diverse cast of dedicated fighters for social justice. Individual chapters highlight particular struggles and their participants, from famous faces to lesser-known luminaries. David sets London’s radical campaigners against the backdrop of the city’s multi-faceted development. Self-directed walks pair with narratives that seamlessly blend history, politics and geography. Specially commissioned maps and illustrations immerse the reader in the story of the city. Whether visiting it for the first time, or born and raised in it, David Rosenberg invites you to see London as you never have before, the nation’s capital as its radical centre. David Rosenberg was born in London in 1958. His grandparents came to the East End as Jewish immigrants from the Tsarist Russian Empire in the 1900s. As a teacher and educationalist he has worked on and participated in projects in Uganda, South Africa and India. His writing on history and current affairs has featured on several Channel4 websites and in many print publications. He is the author of Battle for the East End: Jewish responses to fascism in the 1930s, (Five Leaves Publications) and his new book, Rebel Footprints: a guide to uncovering London’s radical history (Pluto Press) is due out shortly. David divides his working time between primary school teaching, adult education teaching, and a range of freelance activities including writing and editing, training teachers, work on educational projects… and guiding people on East End walks. David worked in the East End as a warehouseperson in the mid-1970s, and again in the late 1970s and worked as Publications Officer for the Runnymede Trust in the late 1980s when they were based just off Brick Lane. In between those dates he regularly visited Tower Hamlets local history library for academic research on East End history. He has a longstanding commitment to Yiddish – the mother tongue of many of the East End’s Jewish immigrants – though he more recently been learning Swahili, a language of some newer immigrants to East London. He has been a regular visitor to West Ham’s football ground at Upton Park since 1966 and is a longstanding contributor to OLAS, the West Ham football fanzine.